There's something mysterious about 108 Garage. Perhaps it's the nondescript façade — a black awning with the numbers 108 in small print — or the elusive menu (we have to rely on TripAdvisor for hints on this one). When we do eventually get our hands on the hard-to-come-by menu, we are none the wiser. The six course tasting menu leaves much to the imagination. Frozen Cashel Blue Wingwalker is about as tangible as Wye Valley asparagus ‘en papillote’. But we are intrigued. There are two set menus, one for meat eaters, one for vegetarians. We try the veggie version. 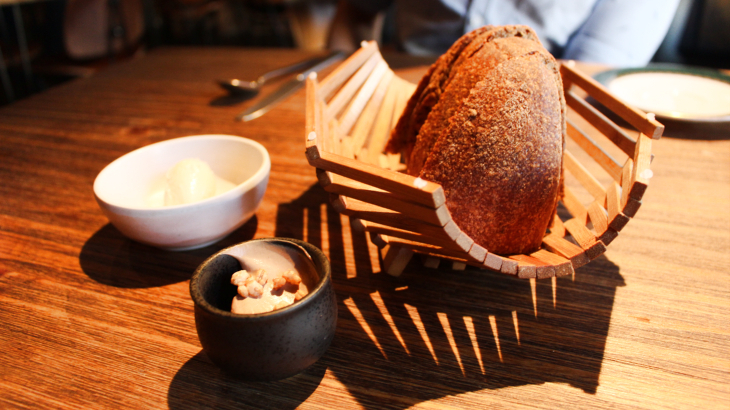 Our appetiser is sourdough bread, served warm, the butter melting as it brushes the surface. Bliss. The first course is the bemusing (at least on paper) raw pea, pickled walnut and frozen Cashel Blue Wingwalker. While the wing walking reference is lost on us, we have no trouble with the dish. 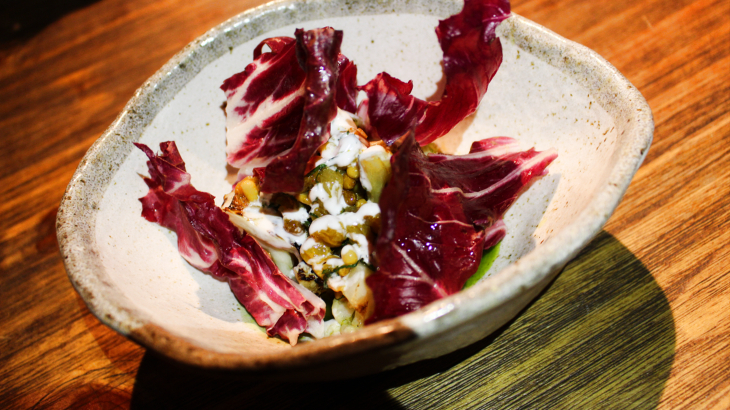 It's a light and refreshing starter; the blue cheese is subtle, the pickled walnut is tangy, and the peas are crunchy. 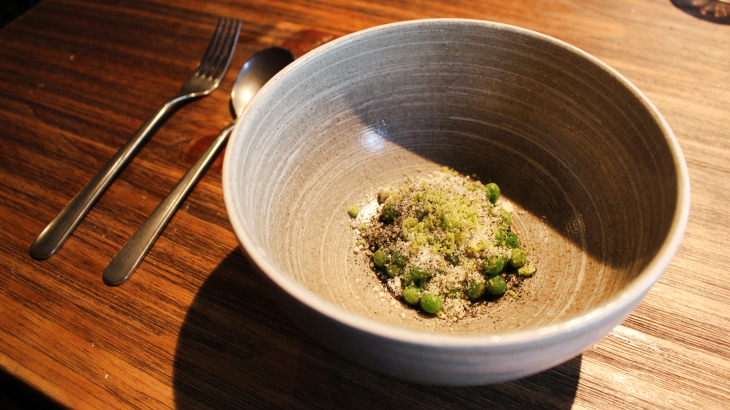 Raw pea, pickled walnut and frozen Cashel Blue Wingwalker. 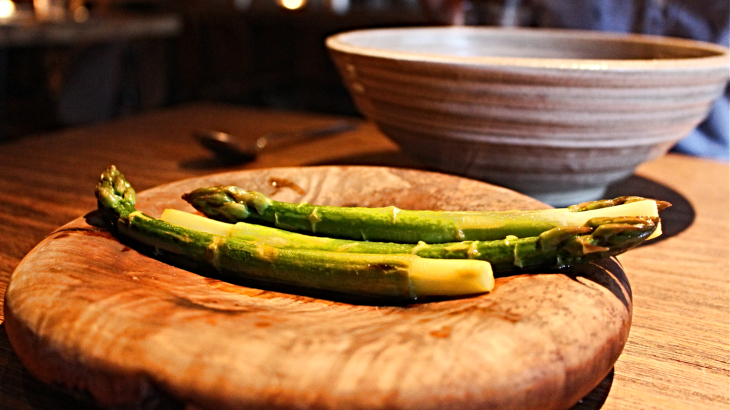 The Wye Valley asparagus ‘en papillote’ — asparagus wrapped and steamed in parchment paper — is up next. The greens are cooked to perfection, with not a limp, mushy stem in sight. The side of creamy artichoke purée is a fine accompaniment, delicate in taste, but rich in texture. Wye Valley asparagus ‘en papillote’. Our third course is BBQ Jersey Royal. 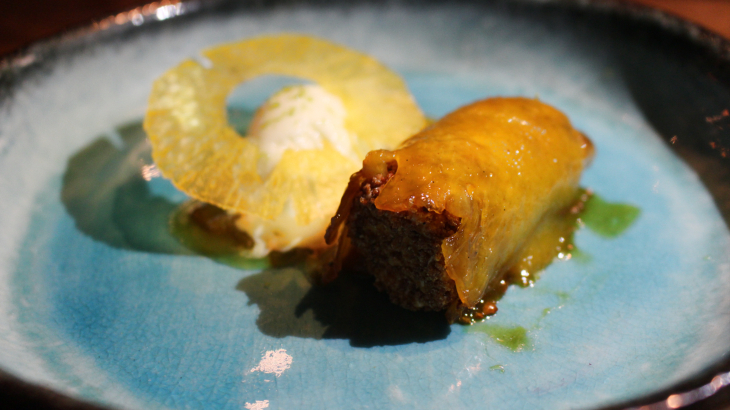 In true tasting menu style, the potatoes are small, very small. They are possibly the smallest spuds we have ever seen. But what they lack in size, they make up for in flavour. The potatoes have a smokey tang, nothing like your sugar-laden-shop-bought BBQ sauce. They are served with a dollop of truffled curd, which is creamy and flavoursome. Roasted cauliflower is up next; a simple description for an elaborate dish. The crunchy cauliflower sits on a bed of velvety cashew nut hummus. A scattering of golden raisins delivers a juicy burst of sweetness. 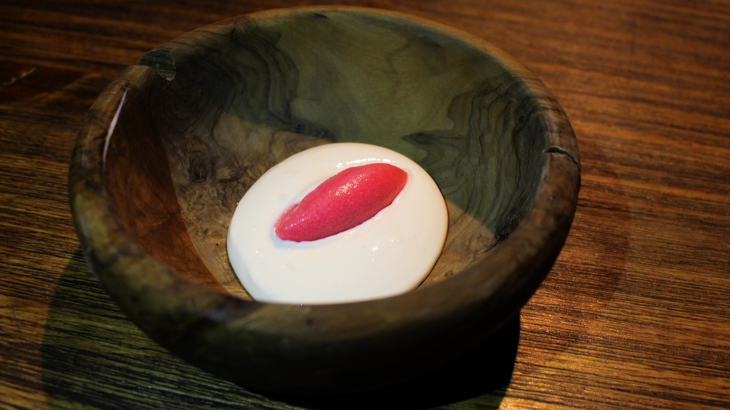 Our next course is the pre-pudding: cherry blossom fromage frais with Yorkshire rhubarb. The cherry blossom fragrance is muted, if not absent; we have difficulty detecting it. But the tart, carefully-sweetened rhubarb, compensates. Cherryblossom fromage frais and rhubarb. Dessert is the only course which offers a choice: rum cheesecake or chocolate tart. We try both, for good measure. The tropical cheesecake, served with pineapple and kaffir leaf, falls short of our expectations. The cake has the texture and taste of an aerated mousse; not unpleasant, but not cheesecake. 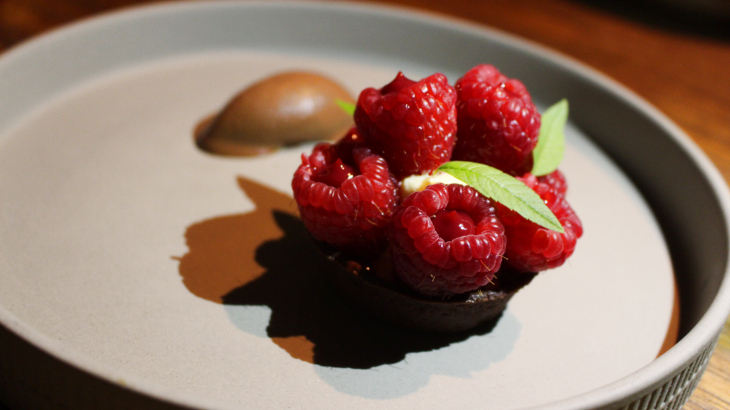 As for the chocolate tart, it is beautifully constructed, a bouquet of raspberries sitting daintily upon a chocolate pastry case. Unfortunately, that’s where the thrill ends; the flavours are uneventful. 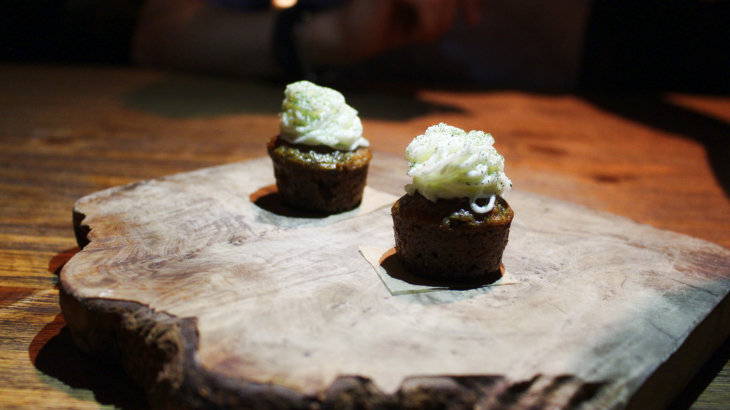 And then, as though our waiter tunes into our silent grumblings, a saving grace arrives in the form of a miniature carrot cake. The bite-size cake is heavenly — moist and light with a sweet and silky cream cheese topping. 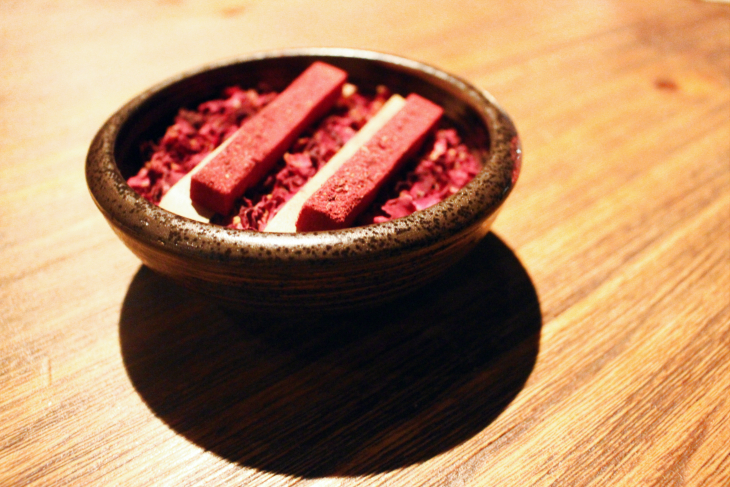 As a final intervention, lest there be any lingering disappointment, we are served one more surprise: a finger of white chocolate fudge, coated in caramelised rose and beetroot powder. Biting into the violet finger, the rich, buttery fudge is the immediate flavour. But the near-acidic beetroot is quick to cut through the sweetness, creating an unique contrast of sweet and piquant flavours. White chocolate and beetroot fudge. 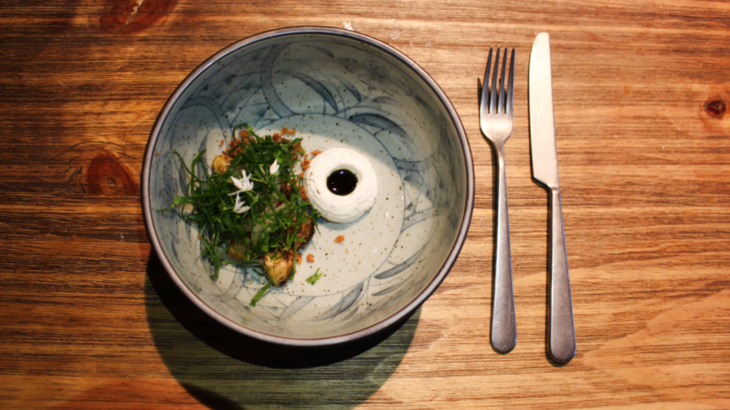 At £60 per head the tasting menu may be steep for some diners. But unlike many haute cuisine experiences — with magniloquent menus and pitiful portions — 108 Garage will leave you satisfied, not starving. 108 Garage, 108 Golborne Road, Notting Hill, W10 5PS.